Generating grinding with dressable tools is an established technology in gear production. 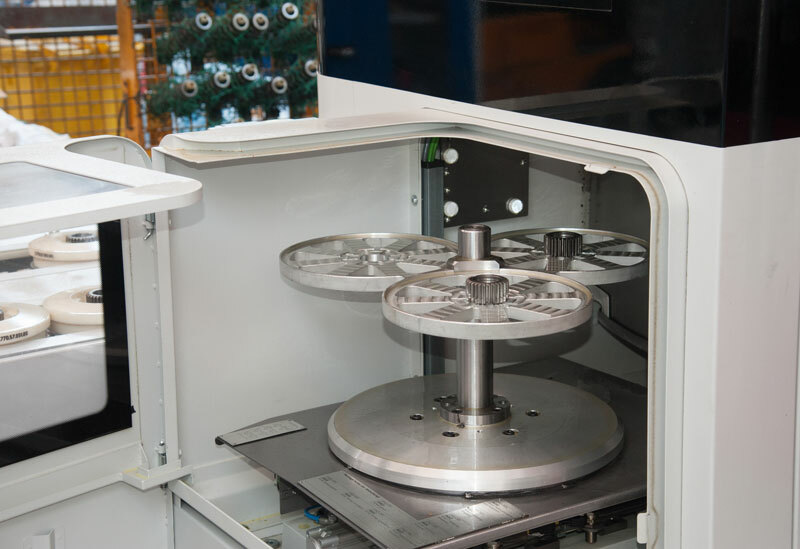 ZF Steyr Präzisionstechnik GmbH uses this process for a wide variety of applications, from series production to prototyping. Flexible machines manufactured by Kapp Niles can master all applications at the shortest set-up time and fully integrated into automatic production. They can be easily used for profile grinding in special productions or prototyping which cannot be realised with generating grinding. KAPP NILES Generating Grinding Machine KX 260 DYNAMIC with pick-up axis. ZF is a world-leading technology group in driveline and chassis technology with around 230 sites in nearly 40 countries. One of these is ZF Steyr Präzisionstechnik GmbH in Upper Austria. Around 500 employees produce components and gears for agricultural machines such as tractors, combine harvesters, forklift trucks, construction and special machines as well as steering gear components for the automotive industry. The company rarely produces a large series for this portfolio, but rather focuses on small to medium series with high part variance. Typical batch sizes are 200-500 pieces; but for some products it can also be as large as 5,000-6,000. Capacity utilisation is high. Usually 17 shifts are scheduled per week, i.e. three from Monday to Friday and two on Saturdays. Up to 20 shifts may be used for large orders. Requirements resulting from the portfolio are diverse and very demanding. There are seasonal fluctuations for the parts of agricultural machinery - a significant peak in the spring - compared to car manufacturing. However, the major issue is the extraordinarily high precision. It is no wonder that "Precision Technology" is already included in the name of the company: Steyr. The noise emission requirements require immense accuracy for some components. The steering gears, which are located near the passenger compartment, are a typical example. The small gears are also ground from the rod. A similar level of precision is required for E-lift trucks which mainly operate in production halls. There, the noise level generated by the production noise should not be increased even more by the industrial trucks. Along with the day-to-day business, prototypes must also be produced from time to time. ZF Steyr relies entirely on the products of Kapp Niles for grinding purposes. Fifteen different machines are in production; some are brand new while others are from the 80s. Otmar Schlachter, authorised signatory and Head of the Production Process and Tools Management at ZF Steyr, explains the long-standing cooperation; "With Kapp Niles, the combination of tool and machine works perfectly; the machines are always running and in the shortest time. You do not always find this interaction between machine and tool with manufacturers from whom you only buy one part.” Lukas Aigner, Deputy Head of the Profit Centre Wheels, adds; "The user interfaces are mostly the same. This is an advantage for us in production. An employee who is trained on one machine can also operate the others. In addition, many components are interchangeable. This facilitates the maintenance work." 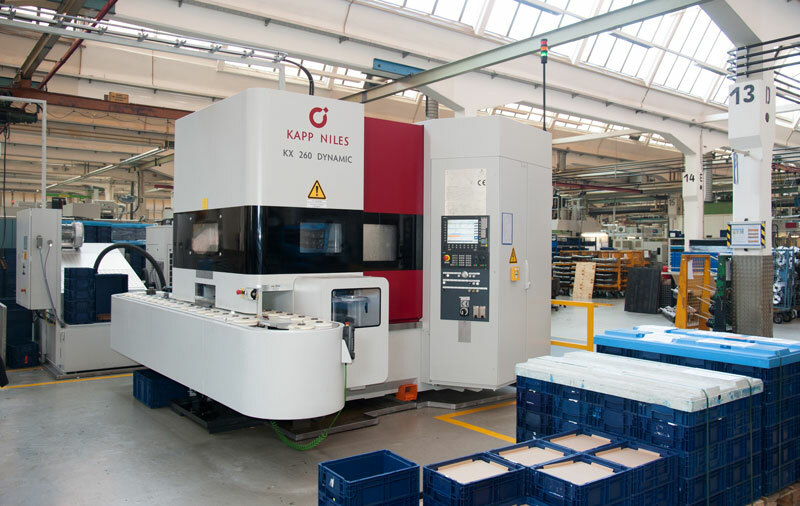 In general, Kapp Niles tries only to use as many new parts in a machine as necessary in order to simplify the spare parts maintenance of various machines for the customer. The service also includes remote diagnosis which allows a technician from KAPP NILES to get an impression of the machine in question before travelling to the site. At times, this might even completely save a journey to the customer. Even service works such as installing new software updates can be done online. The latest acquisition at ZF Steyr is the KX 260 DYNAMIC generating grinding machine. A smaller version, the KX 100 DYNAMIC, has already been in use for a while. Both are further developments of the multi-spindle design already realised with the KX 160 TWIN. As a pick-up machine with integrated automation, it is characterised by very short set-up and process times as well as a low surface requirement. The optional automated clamping device makes these machines equally suitable for series production with large and small batches. The KX 100 DYNAMIC has two separate, rotatable mounted columns, whereas the KX 260 DYNAMIC has only one. These are fitted with vertically moveable pick-up axis, each equipped with a workpiece spindle. While a workpiece is being ground, the other pick-up axis removes the finished workpiece and loads a blank part on the workpiece spindle. 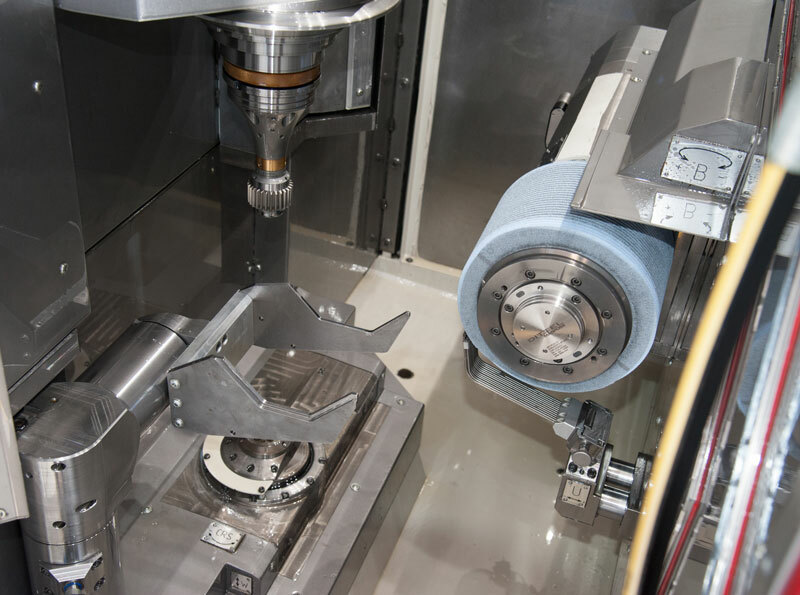 The workpiece is aligned outside the working space, so that the workpiece spindle can be swivelled to the processing speed and synchronised into the work space. This reduces the non-productive times. For the KX 260, this can be reduced to 3.8 seconds. The multifunctional axis is used for discharging measurement and test parts. The multifunctional axis allows the extraction of measuring and test parts. Only continuous generating grinding with adjustable grinding tools is used as the processing method. Depending on the application, both dressing tools with integrated head dresser and flexible tools with independent head dresser can be used on the dressing unit. The "Topological generating grinding" option makes it possible to produce gear grinding with or without targeted entanglement. The advantage of the machine concept is the full integration of automation functions, since the parts can be loaded and unloaded from a belt without further handling devices. Optionally, a measuring unit is available for measuring and evaluating all relevant gearing features. The DYNAMIC machines do not only save time during the manufacturing process through automation. The set-up operations are also partially automated, such as the automatic screw change. For this purpose, only the interchangeable prism is manually swivelled out of the park position. The machine then places the tool securely at the push of a button. The operator swivels the tool into an ergonomic position and changes the screw manually or with a hoist. The operator should neither loosen the screw nor climb into the machine. Lukas Aigner: " The change can also be easily managed by new employees, as the machine shows the setup sequence on the Display and provides point-by-point instructions on what to do. In addition, the employee must acknowledge every step so that no mistakes occur. " Here, the interchangeable prism swivels out of the park position and ready to receive the screw. Even if the performance characteristics of a single machine are good, this alone is not sufficient for ZF Steyr's production. Otmar Schlachter says; "Of course quick machining times are important, especially for small components in large quantities. The pick-up procedure is a valuable tool for this purpose. For us, however, the fact that the diamond dressing rolls are interchangeable on all machines is also very important. When a machine is occupied, we can move to another machine for an order. It is only thanks to this flexibility that we can manage our portfolio." 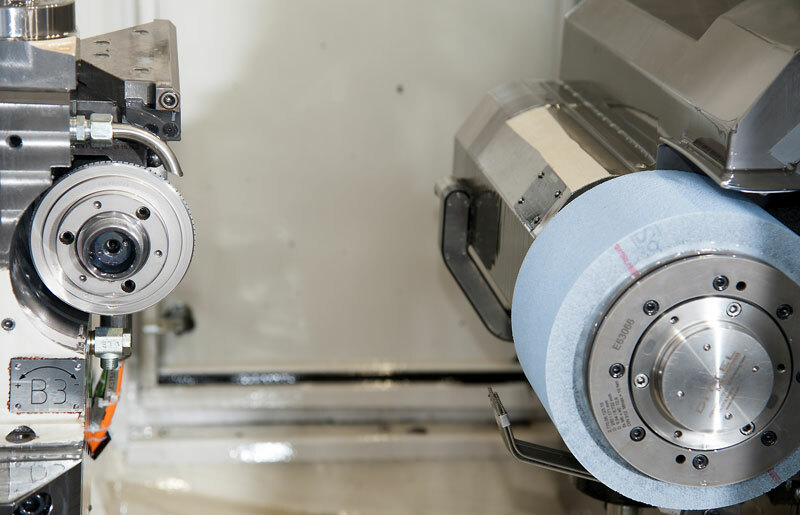 The diamond dressing roll on the left in the picture can be used on all machines. Of course, the support is also important when producing a new product. Otmar Schlachter; "Sometimes, we need a suitable dressing roll for a new gearing at short notice. Kapp Niles offers a very good and quick service for this purpose." Lukas Aigner addresses another application; "For some components, the generating grinding reaches its limits, e.g. in cases of several gearings on one component, double wheels, etc. which can no longer be machined with large tools. 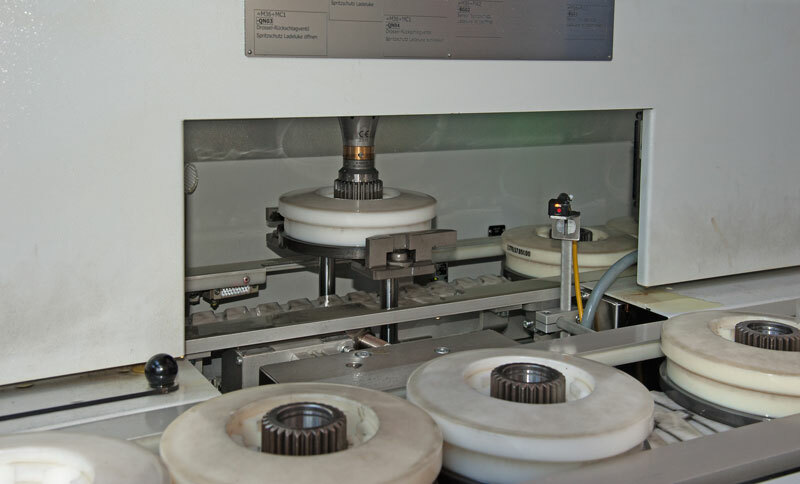 We have equipment on which we grind up to 70% with CBN wheels in sub-processes (profile grinding). Although the grinding process takes longer, a component, e.g. a lateral ring, can be produced in one clamping. This saves on overall throughput time. " Small and medium batch sizes are the core business in Steyr. From time to time, however, prototypes are also required. There are only a few ZF sites that can take over this. In case of large series production of passenger cars, it is very difficult to organise such special orders. Nevertheless, the corporate group relies on these components. Otmar Schlachter explains; "Gear manufacturers want new features every 3-4 years. In the case of upper class vehicles, the demands on performance and gearing keeps increasing while the installation space remains the same. One has to produce prototypes quickly during operation. Companies gladly send us such orders. "For this purpose, the production with adjustable discs is unbeatably fast. Lukas Aigner describes it vividly: "You take a grinding wheel, pull the profile on it and you can grind within one day. You would have to wait 8-10 weeks for a new tool. It is then ground out of the full material. In case of a prototype it is irrelevant if the machine runs for two hours." 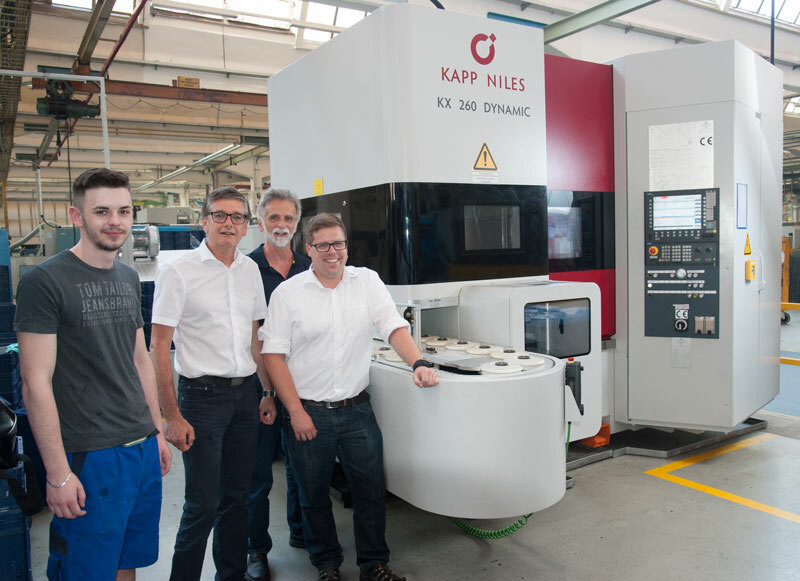 Ulrich Roos, Regional Sales Manager for Automotive Sales at Kapp Niles, describes how the KAPP NILES machines support this process: "Some machines must be programmed block by block. Our controls can independently generate programs. First, you simply enter the gearing and technology data. The latter can even be left to the machine. It then makes suggestions for the number of cuts and strokes, speed, infeed depth, etc. Therefore, you do not need to know all the complex interrelationships. If needed, you can of course make corrections based on your own experience. Once the input is complete, the machine generates the program at the push of a button. " The described, varied tasks require individual solutions. Ulrich Roos says; "Our advantage is the broad product range: We are proficient in profile and generating grinding, combined with single-spindle, double-spindle and pick-up machines. Moreover, our machines are universal. We can also perform, for example, internal grinding on the large KX 500 FLEX. Hardly any other manufacturer has this wide range of processes and machine configurations in its portfolio." One of the specialities of KAPP NILES are small grinding discs for workpieces with interfering contours. The Coburg company has a lot of experience with these components, which are typical for ZF Steyr. It manufactures its own tools and has developed machines with above-average speed for workpiece and tool spindles. This makes it possible to achieve high cutting speeds even with small tools. This has another advantage for integration into automated production: The workpiece is immediately degreased in the machine through centrifuging. Thus, an oil discharge in the transfer station and carry-over onto the conveyor belt is avoided without a separate handling. ZF Steyr uses this option for the steering gear production on the KX 100 DYNAMIC. In addition to the main features, precision and speed, these features help to integrate the machines perfectly into a highly flexible production. "The machines feature high technical availability. In addition, the service is excellent", says Otmar Schlachter, summarizing the experience with Kapp Niles. A statement confirmed by the excellent cooperation and the large machinery.